I finally feel like it's Fall . . .I'm in full-on pumpkin mode and running my oven warms up my downstairs just enough to take the late afternoon chill off. 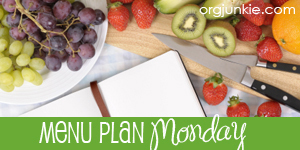 For more inspiration or to link up your own weekly meal plan, visit I'm an Organizing Junkie. Hi Shanna - welcome and thanks for following!